Is everything in your restroom ADA compliant? Have you provided the latest in touch-free systems to reduce the risk of cross contamination? Are you aware of Sick Building Syndrome or the term Indoor Air Quality? Want to reduce your employee's sick days? We can help you implement a facility plan that will enhance the environmental standards of your routine cleaning activities without sacrificing cleaning effectiveness. Let us show you how to replace your current cleaning program with fewer, safer products. While we are doing all this, let's discuss the environment. Green Cleaning is an emerging trend sweeping the country, as people demand their businesses, schools and medical facilities be safe and environmentally friendly. Equipment that utilizes recycling features use less water and chemicals made from bio-renewable sources. 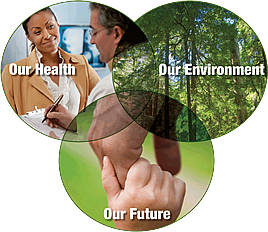 Offering you these options on products and systems supports our goal of sustainable solutions for our customers.